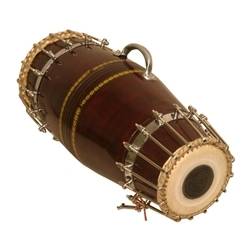 Our Pakhawaj, Bolt drum is 24" long, two-headed wooden shell drum with bolt tension. Held horizontally, the two opposing heads are bass and tenor. Wrench is included. The small head is approximately 6". The large head is 10 1/4".